The largest sports media property in Asian history, ONE Championship™ (ONE), announced another blockbuster evening of authentic martial arts action. 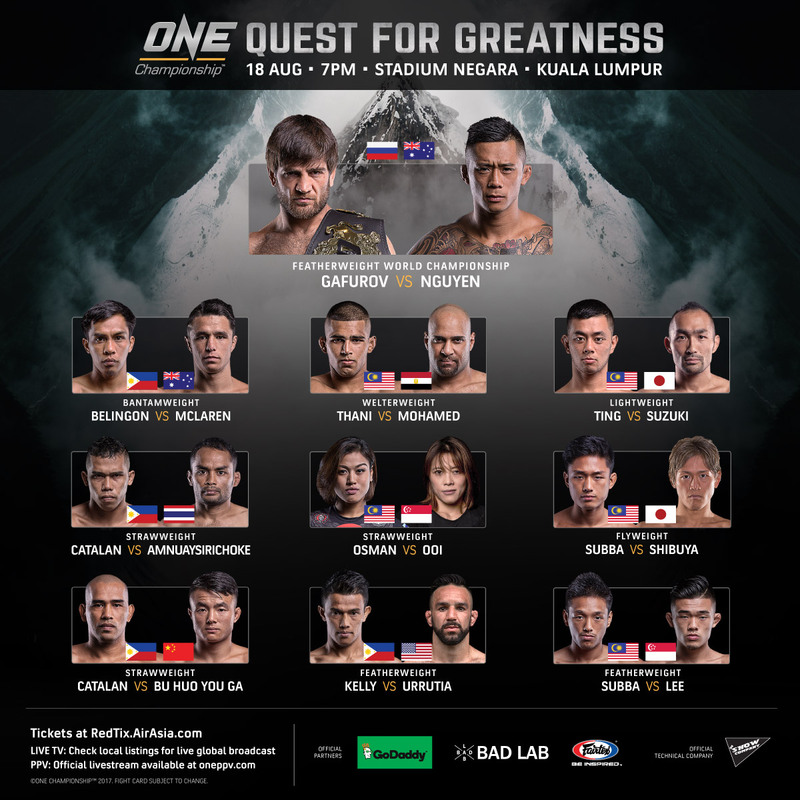 ONE: QUEST FOR GREATNESS is set to return to the iconic Stadium Negara on 18 August for another spectacular showcase of Asia's top martial arts talent. In the main event, undefeated ONE Featherweight World Champion Marat "Cobra" Gafurov of Russia puts his world title on the line against top contender Martin "The Sifu-Asian" Nguyen of Australia. 28-year old Martin “The Situ-Asian” Nguyen of Sydney, Australia, is a former featherweight title challenger with a 8-1 professional record. His only loss came at the hands of reigning ONE Featherweight World Champion Marat Gafurov, when he stepped up to accept their first showdown on just a few days’ notice. None of Nguyen’s victories have gone to a decision, giving him five solid knockout wins as well as three victories by submission. In his last bout, Nguyen defeated Japanese veteran warrior Kazunori Yokota via first-round knockout. Nguyen’s all-around skill set allows him to compete at the highest level as a professional. In a highly-anticipated rematch, Nguyen once again receives a shot at the ONE Featherweight World Championship when he takes on Marat Gafurov for the second time. 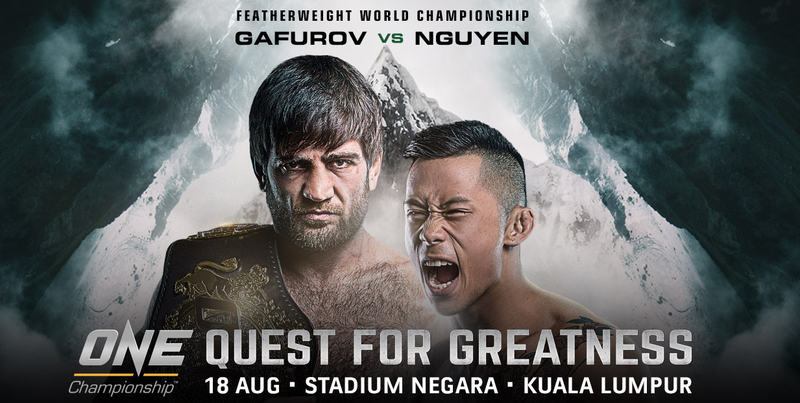 Kuala Lumpur is in for another explosive night of the world’s most exciting martial arts action, as ONE Championship returns to Kuala Lumpur’s Stadium Negara with ONE: QUEST FOR GREATNESS. 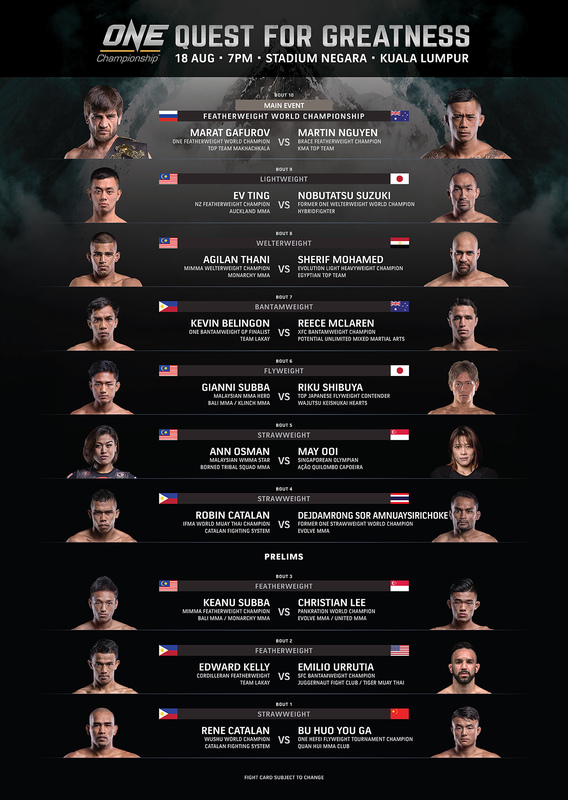 In the main event is a highly-anticipated contest featuring reigning ONE Featherweight World Champion Marat Gafurov (15-0), who rematches surging challenger Martin Nguyen (8-1) for the title. Furthermore, several thrilling bouts on the night could produce the next world title challengers, as Ev Ting takes on former welterweight titleholder Nobutatsu Suzuki, Kevin Belingon faces Reece McLaren, while Gianni Subba battles Riku Shibuya. Also lined-up on the fight card are Malaysian superstars, Agilan Thani, Ann Osman and the Subba brothers will be also be battling for national glory alongside other MMA artists in Asia, so don’t miss out on the biggest Fight Night Malaysia! Slogan: Which fight on the fight card will be interesting and why?